Austin 10K’r invites you to join us for a unique variety of fun running routes that will compliment your Cap10K training. 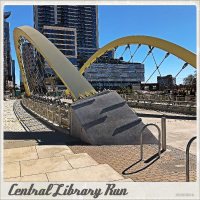 The Central Library Run is a creative 3 to 5-mile route that travels across the river into downtown with a quick stretch down West 6th and then a majestic crossing of the new Butterfly Bridge on West 2nd. From the bridge the new Austin Central Public Library can be viewed nestled along the beautifully landscaped banks of Shoal Creek. This urban route is a combination of sidewalk and pedestrian paths that finishes with scenic hike ‘n’ bike trail along the lake.